What’s in our name? An apple box? What is an apple box anyway? To those of us in the video production industry, an “apple box” isn’t just something your new iphone 6 or mini ipad comes in. 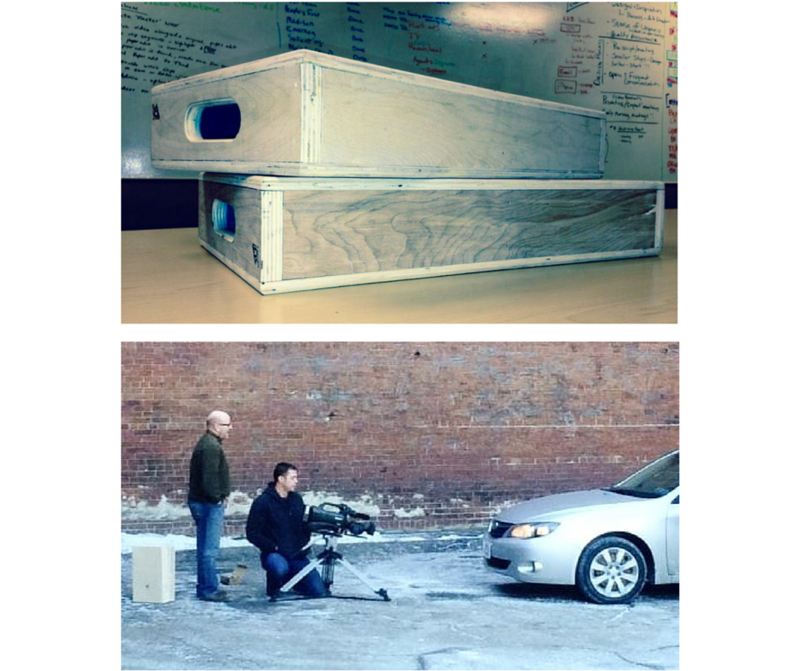 The humble apple box is a standard piece of video production equipment that serves several different purposes on set. This wooden box is often considered a great unifier and a core concept among our company, Apple Box Studios. For our new friends, one of Apple Box Studios’ specialties is full-service video production, hence the related name. Here at The Box you can find many apple boxes lying around paying homage to its unlimited functions. As a full service ad agency and video production company, you can be sure to find these wooden boxes on each one of our shoots as well as around our office. They come in handy as seats for our director, as support for equipment, they assist with light stands staying level, they keep dollys flat on a steep slope, get rigged to a ladder to hold a camera high up and are even used to trick the camera into thinking talent is taller than they actually are. 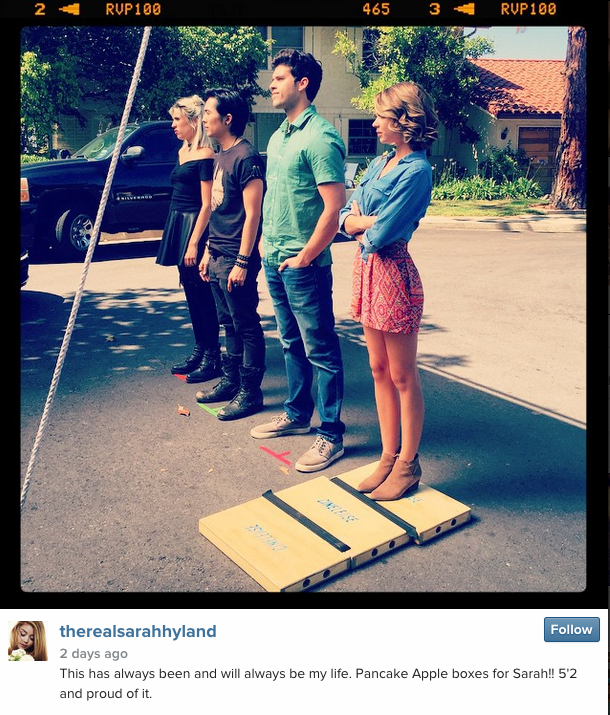 If you’re a Modern Family fan, actress Sarah Hyland often uses this trick. See her Instagram post below from just a few days ago. If you’ve ever been on set, you might have taken a squat on an apple box (although, we don’t encourage our crew to take regular box squat’s, unless they are the camera operator), but do you know there are all kinds of different sizes and names for these wooden boxes? Sarah Hyland, above, isn’t just giving her box a cute nickname, “get me a few pancakes” is actually a call you’re likely to hear on set. Apple boxes in the camera department are most obviously used to elevate the camera anywhere from a few inches to a few feet depending on how many are stacked, the specific size and side you choose to use. One tip we’d give is also using camera wedges – they are smart to help level the camera for times when the boxes are not as stable as they could be. Camera operators and camera assistants (ACs for short) as well as directors of photography (DPs) heavily use apple boxes as seats. These people aren’t lazy, the boxes provide support and stabilization and are used to hit subjects at a certain angle or height. If you’re on set, a third common use of these boxes is for resting the camera on them in handheld situations. If you’re a 2nd AC, it’s usually appreciated and more time efficient to have an apple box on standby for the 1st AC to rest the camera on in between takes. Cameras and attached equipment are heavy, no operator wants to keep lifting them from the ground all the way onto their shoulders. Of course there are a million more different uses for apple boxes, but many of them are unique to certain situations. The different sizes are designed to be modular so two half apples would be the same size as a full apple box or two quarters would be the same as one half apple. Did you know about these fancy positions? 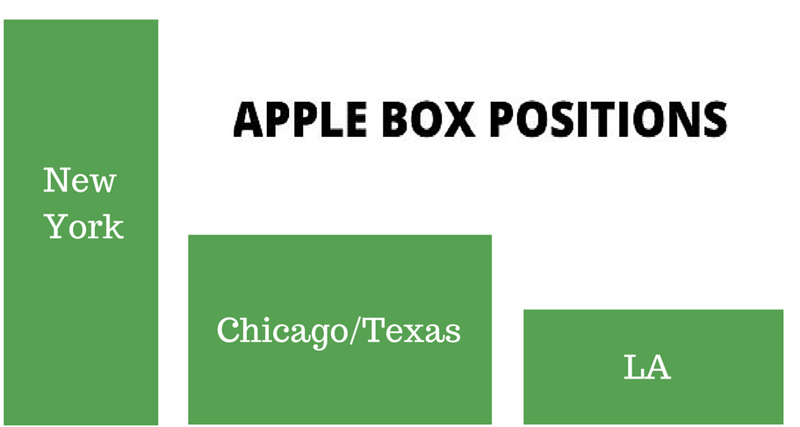 An apple box can be placed in one of three positions, New York, Los Angeles, or Texas/Chicago position. The New York position refers to The Big Apple’s tall skyscrapers and sits on the box’s shortest side making it the tallest position. The Los Angeles position, however, is when the box is at its lowest, or when it rests flat on the floor. Finally, the Texas or Chicago position is when the box is resting on its longest side, sitting at a medium height. Have some free time on your hands and want to see an apple box in action? Check it out here. We’re always impressed with the creative ways grips, production assistants and different crew members use apple boxes. They are practical, serve several purposes, time and cost effective, come in different sizes and shapes, are unifying and often serve as great solutions. For all these reasons and more, the humble apple box was chosen for our company name years and years ago – it’s where it all began for our Pittsburgh video production and ad agency. It’s still a core concept for us today. How do you use apple boxes on set? Any tips or stories? We’d love to hear them. Share your apple box experiences or fun facts with us on our Facebook or Twitter page!